2011 KTM 1190 RC8 R Red Bull. Picture credits - KTM. Submit more pictures. The 1190 RC8 R Red Bull Edition bikes come individually numbered with limited edition IDM Red Bull paint and graphics and have all the same features of the 1190 RC8 R plus a closed course club race kit which includes: an Akrapovic Evo4 titanium exhaust system, modified valve timing, a thinner spec cylinder head gasket and. Club Race Kits are for closed course competition only. Frame type: Chromium-Molybdenum trellis frame, powder-coated. Subframe: Aluminium. Ask questions Join the 11 KTM 1190 RC8 R Red Bull discussion group or the general KTM discussion group. Get a list of related motorbikes before you buy this KTM. Inspect technical data. Look at photos. Read the riders' comments at the bike's discussion group. And check out the bike's reliability, repair costs, etc. 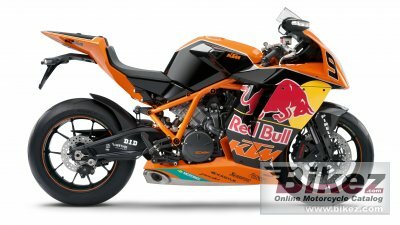 Show any 2011 KTM 1190 RC8 R Red Bull for sale on our Bikez.biz Motorcycle Classifieds. You can also sign up for e-mail notification when such bikes are advertised in the future. And advertise your old MC for sale. Our efficient ads are free. You are also welcome to read and submit motorcycle reviews.